The Toll House Inn of Whitman, Massachusetts, was established in 1930 by Kenneth and Ruth Graves Wakefield. 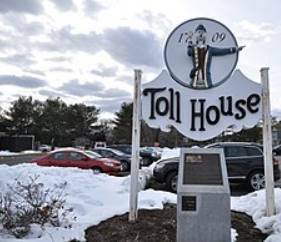 Toll House chocolate chip cookies are named after the inn. Ruth Wakefield cooked all the food served and soon gained local fame for her desserts. In 1936, while adapting her butter drop dough cookie recipe, she became the inventor of the first chocolate chip cookie using a bar of semi-sweet chocolate made by Nestlé. The new dessert soon became very popular. Wakefield contacted Nestlé and they struck a deal: The company would print her recipe on the cover of all their semi-sweet chocolate bars, and she would get a lifetime supply of chocolate. Nestlé began marketing chocolate chips to be used especially for cookies.Wakefield wrote a cookbook, Toll House Tried and True Recipes, that went through 39 printings starting in 1940. Wakefield died in 1977, and the Toll House Inn burned down from a fire that started in the kitchen on New Year’s Eve 1984.The inn was not rebuilt. The site, at 362 Bedford Street, is marked with a historical marker…. Although there are many manufacturers of chocolate chips today, Nestlé still publishes the recipe on the back of each package of Toll House Morsels.